"MISO" this is my next project as a Recipe Developer. 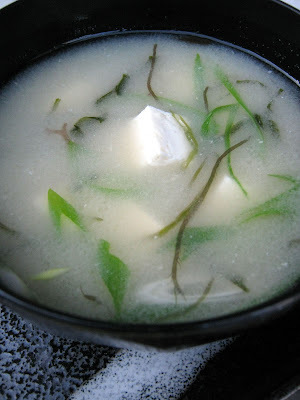 Well, if you say MISO, the first thing that comes to mind is MISO Soup which is the most popular dish here in the U.S. I think. Do you like MISO Soup? How Often do you eat MISO Soup? Have you ever made MISO Soup at your home before? What kind of ingredients do you like into your MISO Soup? BUT, have you considered how much sodium is in MISO? Here's a little tip, Please try to use ingredients with a high potassium into your MISO Soup, such as Sweet Potato, Spinach, Kidney Beans, Lentils ...etc. These ingredients also helps to control and eliminates excess sodium from your body. Did you just think that "Beans into my MISO Soup?! ", I thought the same thing at first. "Celery?! lettuce? Whew!" But, MISO Soup is like a buffer solution, the soup blend very well with many different ingredients and helps keep the same P.H. Balance. So, you can use various different types of vegetables, meats, and fish, too! I learned this in cooking class during my first year in junior college. Now I use celery, broccoli, beets.. any kind of vegetables, and now I understand that all vegetables have different types of vitamins, iron, and other essential minerals that your body needs to function at it's highest potential. Keeping you healthy, fighting colds, and other germs / viruses from harming your body.